Like Spike: A great Weekend with the Haleys!!! A great Weekend with the Haleys!!! On Thursday, Marie, Joe, Veronica, Tyler, Samantha, Brealynn and Brenna arrived to spend a couple days with me. 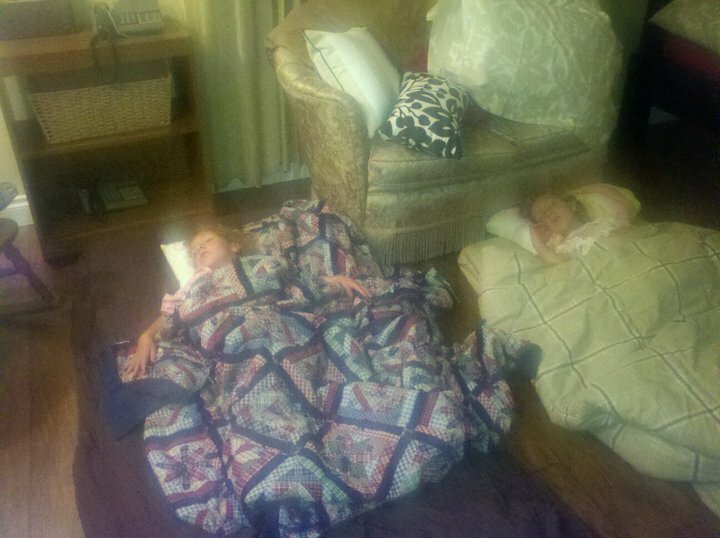 They got here at about 4:30. We walked to this restaurant called Noodle City for dinner. After dinner we took a walk around the U.C. Davis Arboretum then went to Crepeville for dessert. Friday morning, I rented an 8 passenger SUV and we went to San Francisco for the day. Our first stop was Golden Gate Park. It is so large, you could spend a few DAYS and not see everything. We then went the beach. It was COLD and windy, but the kids has a TON of fun playing in the waves and sand. When we finished there, we went to a cute cafe for lunch. The next stop was the Golden Gate Bridge. We took a walk across part of it and enjoyed the sights. We then continued on to Lombard Street, which is known for the small stretch of sharp switch-backs. Our final stop of the day was Fisherman's Wharf. 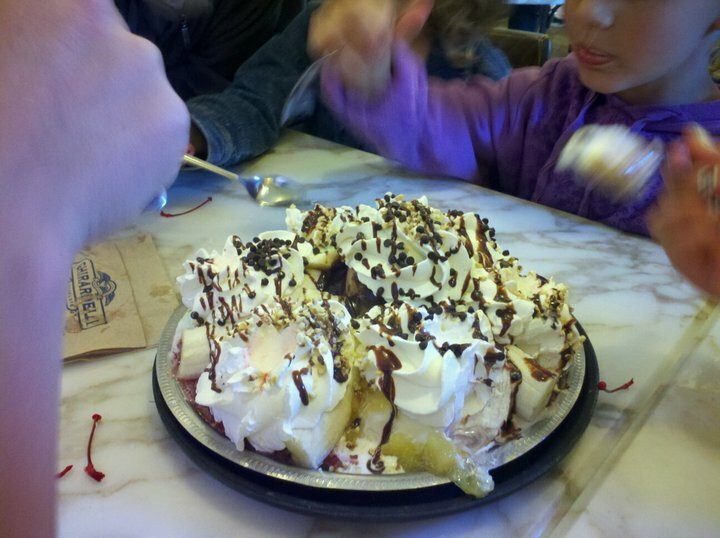 Our first place to visit there was Ghiradelli Square where I ordered the "Earthquake Sundae" (see pictures below) for the kids' dinner! We spent the rest of the evening enjoying the street shows and other sights around the Wharf. Saturday, we went over to the city of Winters and ate at Putah Creek Cafe (previously shown on Dinners, Drive Ins and Dives" where we had an AMAZING breakfast. We also went to my office there so I could show them and Joe replaced a leaking faucet for me. When we arrived back in Davis, we went to the Farmers Market and wandered through and tried some the samples that were being given away. When we finished there, I took them to Yolo Berry Frozen Yogurt for lunch (yes, Aunt Vera gave them ice cream for LUNCH this time!!!). and to visit for the evening. Sunday, they got up and left for more adventures! I am sure Marie and Joe will post some of the same pictures I have on here, but there will surely be many more as well! Enjoy some of our fun times in snapshots!!! Even Joe had to be one of the kids for a bit (don't ask how we got him out of that seat...)!!! The Carousel at the Golden Gate Park. It is one of the few that have the original wooden animals (rather than the current plastic ones). The kids REALLY wanted to go to the beach. Even though it was WAY cold and windy, they had an absolute BLAST!!! Samantha was ECSTATIC about being at the beach! They loved the beach sand! Me with the Haley kids at the Golden Gate Bridge. The Haley Family at the Golden Gate Bridge. We drove down Lombard Street which is known as "crookedest [most winding] street in the world" (although the actual fact is contested). It is famous and we can now say we have been there!!! Just finished driving down Lombard Street. THIS, folks, is the "Earthquake Sundae" from Ghiradelli Square. Come visit and I will get one for us to share!!! Do you think they were excited about eating it?! I told them I wanted to see with their smiles how much they liked it!!! Wow, we polished that off! One of the entertainers along Fisherman's Wharf! Do you think we wore them out in San Francisco?! Yolo Berry frozen yogurt for lunch (yes that is two meals of ice cream in two days - hey when you get to visit Aunt Vera, it is ALL GOOD!)!!! The kids posing around the sign to my business! After two-and-a-half days of pure fun they were, again, exhausted (sorry about the quality, I took it with my cell phone and it was semi-dark in the room)!! !